The Netherlands is a major exporter of cut flowers, accounting for 55% of trade followed by Colombia (18%), Ecuador (9%) and Kenya (6%). The major consumptions markets are Germany (19%), USA (17%), UK (16%) and the Netherlands (13%). The industry is becoming increasingly important to the economies of developing counties, bringing in vital foreign exchange for investment in economic development. Most flowers are produced on commercial farms and provide employment opportunities and improved livelihoods for millions of workers. Colombia’s flower exports, for example, generates an income for around 800,000 people while Kenya’s flower industry provides vital income for up to two million people and is the country’s second largest agricultural foreign exchange earner (after tea) at more than $250 million a year. 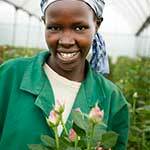 The flower industry employs a largely female workforce of poor, less educated and therefore vulnerable workers. It has long had a reputation for poor working conditions including low pay, over-crowded housing and repression of trade unions. Over the past years, conditions have vastly improved for workers in many countries, but there are still challenges. Fairtrade aims to protect and benefit workers on flowers farms by working with certified farms to ensure decent working conditions for their employees and protecting workers’ rights. These rights encompass economic, environmental and social dimensions of working conditions but also aim to amplify and strengthen the voice and choices of workers’ themselves. A recent study by Fairtrade International with three certified flower plantations in Ecuador, provides useful insight into how workers view their own empowerment and how Fairtrade can support their goals. Fairtrade sales help generate an additional Fairtrade Premium for workers to invest in projects of their choice. In 2012, flower plantation workers received premium payments of £3.7 million which they spent on education, housing improvements, finance and credit services as well as supporting education in their communities by renovating school buildings and providing student bursaries. This video about Ravine Roses, a Fairtrade certified flower plantation in Kenya, shows the difference that Fairtrade Premium funds have made to worker empowerment and community development in the region.